Panel of up to 20 men and women sought following busy first year. Catholic Comment, the group which prepares Catholics to speak on radio and TV in often contentious debates, is looking for more speakers. Since it was launched in June 2012, its 15 speakers have given the Catholic point of view in over 90 media interviews on programmes such as the Late Late Show and Prime Time. There is such demand for speakers that the group is now seeking to recruit another 15-20 people who will train and be available to speak about their faith on national and local TV and radio programmes as requested. “It is so easy to lose patience or to get defensive. 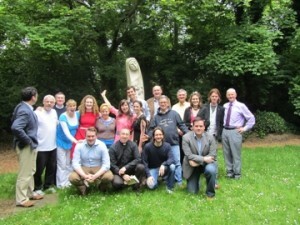 Our whole thing is not to take that approach, but to try and see that we take what is positive out of the story,” Petra Conroy, Project Coordinator of Catholic Comment, told CatholicIreland.net. The 2012 panel of speakers included an engineer, a panel beater, secondary and primary school teachers, a parish pastoral worker, a barrister and a graduate of journalism. One of the speakers, Maura Garrihy (23) is about to begin a new role as Director of Youth Ministry in Galway Diocese. “Catholic Comment has given me the tools to dialogue effectively, and appropriately, about our faith and really try and win hearts as a result – and not arguments! It is a very real way of answering the call to share our faith. Not only have I learned how to communicate in the media but it’s also come in very useful for conversations with friends and family too,” she said. Catholic Comment has had an incredibly busy first year – one in which Pope Benedict resigned, followed by the conclave and new Pope, and at home there was the abortion debate. Some of the TV and radio shows that have featured Catholic Comment speakers are: The Late Late Show, Prime Time, The Frontline, Tonight with Vincent Browne, Ireland AM, Morning Edition, Drivetime, Nuacht a hAon, Newstalk Lunch Time, Evening Extra on BBC Radio Foyle and numerous local radio stations. While it is not easy to put across one’s faith at the best of times, let alone in the heat of a studio debate, Catholic Comment strives to put forward a speaker whenever requested. Catholic Comment had a lot of requests for in studio interviews in Dublin in particular so this will be one focus of the current call for speakers. However Catholic Comment is looking for a wide range of people from around the country – men and women, young and old, from all walks of life. “Mainly people who already have an interest in keeping up on issues in relation to their faith but also with what is happening in the media and in society and what the current debates are,” explained Petra Conroy. Those who have a sincere commitment to Catholic teaching and values and are open to developing media skills, as well as having time for three residential Dublin-based training weekends and are available for speaking in the media in a positive and enthusiastic way – these are the people Catholic Comment watn to hear from. Last year there were over 80 applications and 35 were interviewed which led to the final panel of 20 to go forward for training. Applications for this new panel will be accepted until early October and interviews will take place in early November. Those chosen are strongly encouraged to attend all three residential training weekends. This year they are in Dublin and run from Friday evening to Sunday afternoon on 29th November – 1st December 2013; 24th January – 27th January 2014; and Friday 28th February – 2nd March 2014. Speakers’ Panel Application Form 2013 from: www.catholiccomment.ie or phone Sheena Darcy on 086 087 8704.